Years ago, as a scrawny 16-year-old high school student in the farm-filled middle of the United States, I was given a tattered paperback copy of Henry David Thoreau’s transcendental classic, Walden. I was assigned to read the book by a history teacher who believed that the survey of a particular period’s arts—its literature, music, painting, and sculpture—was the truest form of social studies. I remember racing through the book as quickly as I could turn the pages, taking it with me to the library, then to the high school basketball game, then to my bedroom. There was something about Thoreau’s mid-19th Century musings that felt surprisingly contemporary to me; Thoreau’s ideas seemed to honor the solitude and self-discovery that I was just starting to grasp and explore as a teenager, despite the fact that Thoreau had written Walden from a cabin in Massachusetts when he was around the age of 30. I enjoy rereading that metaphoric passage every year as a reminder—a subtle nudge to myself—to stop and assess the solitude around me, and learn from whatever complex feelings of isolation I might be having. To that point, I’ve seen isolation from a number of angles over the years. I have been fortunate enough to be camping alone in dense forest acreage, under the elaborately hued Northern Lights sky. I have also lived in a big city, where isolation results from the sheer quantity of people; in such a sea of individuals, it’s awfully difficult to separate from the masses and the feelings of anonymity that come with it. 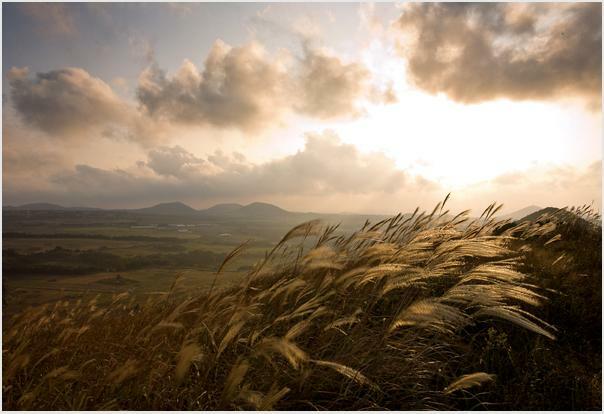 But I find Thoreau’s fascination with the wind and its poetic implications particularly appropriate in Jeju, where I am now happily living and preparing to start teaching in the English Language and Literature Department at Jeju National University. Jeju’s wind is as renowned as its rocks and the vast blue of the ocean, but what I am particularly moved by, on a frequent basis, is the diversity of form the wind takes on this island. This past weekend, for example, a friend and I were hiking in between the boulders of Bangseonmun, enjoying a draft of wind that was following the contours of the valley. Later that same day, I was relaxing on one end of Hamdeok Beach and a much stronger wind was pushing large, bouncing waves into the dark rocks on the shoreline. I watched as a small child and her mother in an inner tube were engulfed by an enormous wave, only to both emerge laughing and drenched a few seconds later. And finally that evening, while enjoying a delicious home-cooked meal with friends, I felt a subtle breeze and heard it rustling the garden leaves outside. I sensed the wind cooling off the earth, embracing our isolated island. Thoreau, of course, never visited Korea, nor was he ever able to ponder existentialism from ideal spots like Jeju’s beaches or Sunrise Peak. But there are countless other writers and scholars who have written wonderfully about Jeju over the years—Yun Bong Taek, Yang Jeon Hyung, Kang Bang Young—and I have thoroughly enjoyed their works. “The Jeju wind cannot sleep,/And thus spreads out the lamps/Selected from the disconnected islands/on the sea,” says Yun Bong Taek in his poem, “Jeju Wind.” Perhaps there is a teenager now, in a classroom somewhere, racing through that poem or another literary book about Jeju the way I raced through Walden, getting caught up in the thrill of the words and images. I like to think so. I will reread Walden again in the near future, I’m sure. I will read it when the season starts to change and the tinge of fall is in the air. It will bring about an assessment of the summer—travels taken, Olles hiked, beaches toured, friendships made and rekindled, solitude enjoyed. But the passages in Walden about wind—the spirituality, creativity, and eternity inherent in the wild—will take on special meaning now in Jeju. Few are the ears that hear it, but on this island, it’s quite easy—the great wind is everywhere.